There are two other “meet xxxx” items on my list. #1 Meet David Suzuki (I’ve given up on this and may write about that one day), and #76 Meet Sting (currently working on that one). I had the most wonderful “meet a celebrity” moment this year at the Big Valley Jamboree, and it definitely warrants posting a photo on the internet! I am a huge admirer of Kevin Costner. The first movie of his I saw was Fandango, followed soon by Silverado, which fell into a time when I loved westerns. Who didn’t love Eliot Ness in The Untouchables; this is one of the best movies ever. I will say nothing about No Way Out, other than I loved it, and you should watch it. That’s it. Then we enter what I think of as the glory days of my love affair with Kevin. Bull Durham, Field of Dreams, Dances with Wolves, Robin Hood: Prince of Thieves, JFK. Field of Dreams and Dances with Wolves hold two of the top five spots on my all-time favourite list. I love both of those characters. I wanted to BE in both of those scenarios, not in the movies as an actor, but I wanted to live in that cornfield in Iowa, or in that teepee. Those movies are on the list of “will never tire of watching.” Also on that list is Wyatt Earp. This is a story that I love (remember, I’m a fan of westerns) and have watched both this version and also Kurt Russel’s Tombstone over and over. That’s where my list of favourites ends (I guess after Tin Cup, the golf movie, which has a soft spot in my heart because there is a scene in there that reminds me of my husband). You can check out the full list here in IMDB. After that, I stopped watching movies for some unknown reason, for a period of several years. 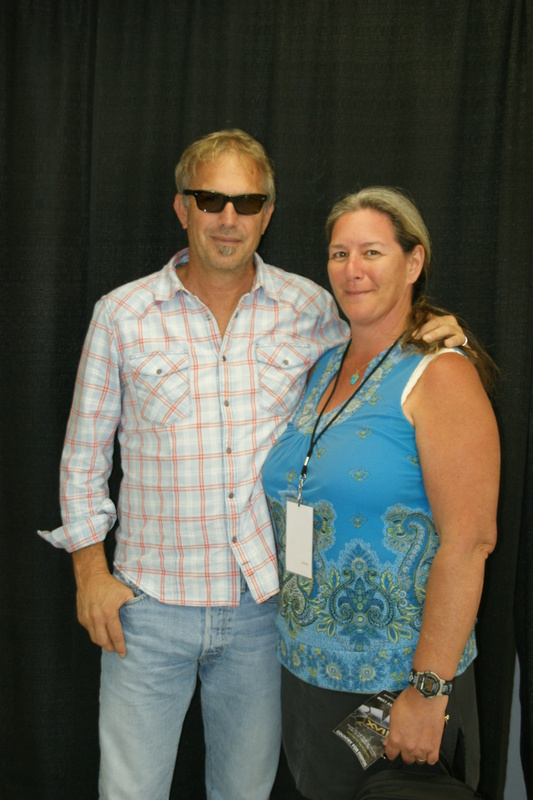 Kevin Freakin' Costner and ME! There is a long and probably boring story about how the actual meeting came about. Suffice it to say I began planning last September, and worked through June and July to put the other pieces in place. On Saturday, July 31, the stars aligned and a dream came true. ~ by ktatkins on August 6, 2010.